You can listen to the discussion online here (for the next 7 days), beginning around the 26 minute point. I had a brief chat with Robert afterwards (he was phoning from the US). He congratulated me on doing a 'great job' (on the show) and was very interested in beginning a dialogue, giving me his email. 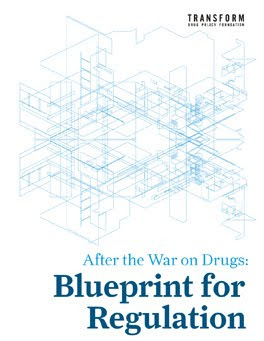 I've promised to send him a copy of the new Transform publication 'After the War on Drugs: Blueprint for Regulation'; it'll be interesting to hear what he thinks. Terrific job. Brilliant to take the debate right to the heart of the darkness, and to have opened up a dialogue. Keep it up. Dupont, while polite, didn't really share much, just held down the talking points. His Frontline interview was much more honest. He saw methadone maintenance work well, but here he acts like heroin maintenance is unthinkable, giving an anecdote about getting alcoholics to abstain as if 1) alcohol is comparable to heroin and 2) abstinence is the only solution to alcohol problems. 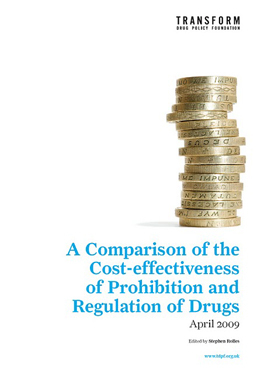 Telling though was/is his tunnel vision in evaluating drug policy (2nd to last paragraph): "Does it reduce use?" So not considered are: black market violence, corruption, incarceration, stigmatization, harms from illicit product, societal harms in supplier countries, et al. yes, the argument that we wouldnt give alcoholics alcohol is not really a very effective response. We dont need to give people alcohol because it is already cheap and available already - theres no crime involved at any point in the production or supply - and drinking is intrinsically safer than backstreet injecting with drity works. That said - if we did we might have better access to some marginal groups who would then be in more regular contact with services. Listening to the Newshour interview of the 21/11/2009 I found myself thinking the same things as when listening to Antonio Maria Costa and countless other certain types of ‘experts’. Whilst it is important to debate the issues in public for obvious reasons. Private dialogue with them is wasteful, perhaps even counter productive. This is a difficult thing to explain to others, how these people think, and why it is therefore, better to spend this time on inspiring more competent thinkers to step into their shoes. It can come out sounding if one is not careful - a little too esoteric. However, a research psychology professor (i.e. one that runs experiments to discount wishful thinking and fluffy ideas) at University of Manitoba, has written a beautifully easy to understand explanation of this phenomena . The down side is, that you need to start at the beginning, so that you understand where he is coming from and the proper meaning of the terms, and therefore its slow to get interesting. Please don’t be put off by the fact that he is not on about the drug problem but dissecting an aspect of American politics (of which, we only too obviously now have our own examples in the UK) . If you can get as far as the meaty stuff (and for those not used to thoughtful contemplation they might find it a slog), you'll see that the bad drug policies are born of the very same type of thinking dysfunction and so the two things share the same solutions. You should have asked Dupont how many millions he has made from his drug testing company, Bensinger, Dupont & Associates. After setting up mandatory drug testing Dupont and his buddies cornered 350 top government contractors and cashed in big time. Enthusiasm for drug testing cools when people learn that drug tests are a counterproductive fraud established by people who are directly profiting from the laws they lobbied on to the books. Another point of concern is the fact that 65 prescription and over the counter medications produce false positive results. If someone takes Advil, Nuprin, Motrin, Excedrin IB (Ibuprofen), Aleve (Naproxen) , has a Kidney infection, Diabetes or Liver Disease there could be a false positive for marijuana. Nyquil, Contact, Sudafed, Allerest, Tavist-D, Dimetapp, Phenegan-D, Robitussin Cold and Flu, Vicks Nyquil (Ephedrine, pseudoephedrine, propylephedrine, phenylephrine, or desoxyephedrine) create erroneous indications for amphetamines. Poppy Seeds, Tylenol with codeine, Cough suppressants with Dextromethorphan (DXM), and most prescription pain medications produce a false positive for Heroin use. While they held office, Peter Bensinger (former DEA head), Robert L Dupont (former drug czar) and Carlton Turner (former drug czar) shamelessly promoted drug testing as the solution to drug use. Later, they joined together to form Bensinger, Dupont & Associates, the world's largest drug testing company, to cash in the drug testing laws they wrote. Bensinger, Dupont & Associates reaps a fortune for their useless drug testing schemes. The simplest rebuttal is to highlight that giving pharmaceutical nicotine to people who are already addicted to it (from smoking tobacco) increases their chance of quitting. Many Swedes, due to the availability of low-nitrosamine smokeless tobacco [SLT], use it to overcome their more dangerous addiction to cigarettes. The availability and use of diamorphine in a supervised setting would be helpful to heroin addicts because many of the destructive risks associated street heroin will be minimised i.e. HIV infection, overdose, being arrested. Brilliant! Well done! As others here have mentioned Dupont is financially invested in seeing prohibition continue with his drug testing venture. It's a shame the newshour anchor wasn't clued into that. Wonderful to listen to a sober, yet passionate and super competent debater like you.